Post: Gaurav Akrani. Date: 7/07/2010. Comment (1). Label: Advertising. Advertising facilitates large-scale marketing. It is a medium of mass communication. Manufacturers supply information about new products through it. The fact that companies spend millions of dollars on it through TV, radio, the internet, and newspapers indicate its benefits in sales promotion. Advertising is within the scope of a promotion, which is one element in the marketing mix. It is getting popularity in the present highly competitive and consumer-oriented marketing. All products old and new, consumer and durable, cheap and costly need extensive advertising for sales promotion and customer support. Latest communication techniques now are used for making it more attractive and agreeable. Advertising acts as a marketing vehicle and is useful for drawing the attention of people (prospects) towards a particular product or service. 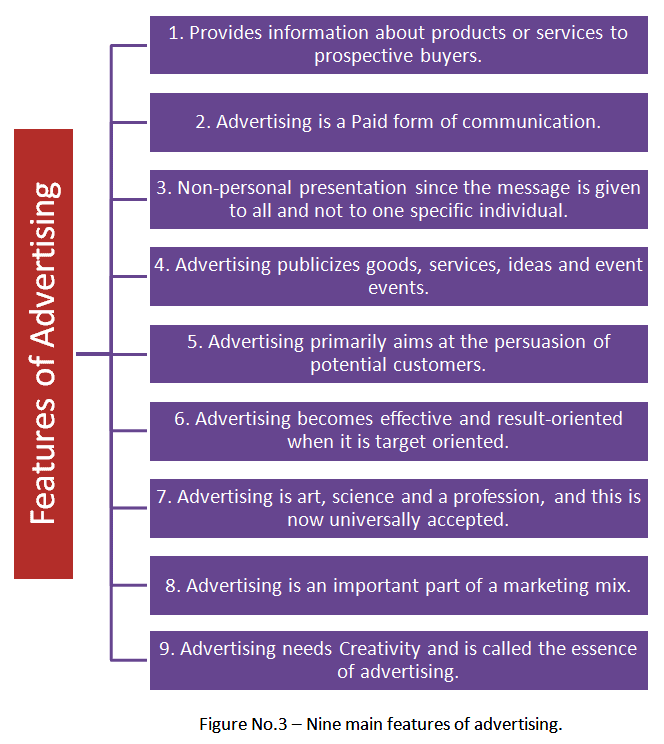 Advertising is defined differently by various authorities and the institutions dealing with its subject. Advertisement is a paid form of communication. Advertiser exercises a control over it. It is a medium of mass communication for large-scale selling. It acts as a valuable marketing tool for presentation and promotion of ideas, goods and services. It needs the sponsor of the message known. Advertising will be meaningless if the advertiser is unidentified. Provides information: Advertising's primary purpose is to provide information about products or services to prospective buyers. The details of products such as features, uses, prices, benefits, manufacturer's name, so on; are in the advertisements. The key message and brand name are also there. The information supplied educate and guide consumers and facilitate them to make a correct choice while buying a product. Paid communication: Advertising is a form of paid communication. The advertiser pays to the media for giving publicity to his AD message. He also decides the size, slogan, etc. given in the advertisement. Non-personal presentation: Advertising is non-personal in character as against salesmanship, which is a personal or face to face communication. Here, the message is given to all and not to one specific individual. This rule is applicable to all media including the press. However, even in it, target consumers or target market can be selected for making an AD appeal. Publicity: Advertising publicizes goods, services, ideas and event events. It is primarily for giving information to consumers. This information is related to the features and benefits of goods and services of different types. It offers new ideas to customers as its contents are meaningful. The aim is to make the popularize ideas and thereby promote sales. For example, an advertisement for family planning, family welfare, and life insurance is useful for placing new ideas before the people. Primarily for Persuasion: Advertising aims at the persuasion of potential customers. It attracts attention towards a particular product, creates a desire to have it, and finally induces consumers to visit the market and purchase the same. It has a psychological impact on consumers. It influences their buying decisions. Target oriented: Advertising becomes effective and result-oriented when it is target oriented. A targeted advertisement intensively focuses on a specific market or particular groups of customers (like teenagers, housewives, infants, children, etc.). Here, the selection of a particular market is called a target market. Art, science and profession: Advertising is art, science and a profession, and this is now universally accepted. It is an art as it needs creativity for raising its effectiveness. It is a science as it has its principles or rules. It is also a profession as it has a code of conduct for its members and operates within standards set by its organized bodies. In its field, AD Agencies and space brokers function as professionals. 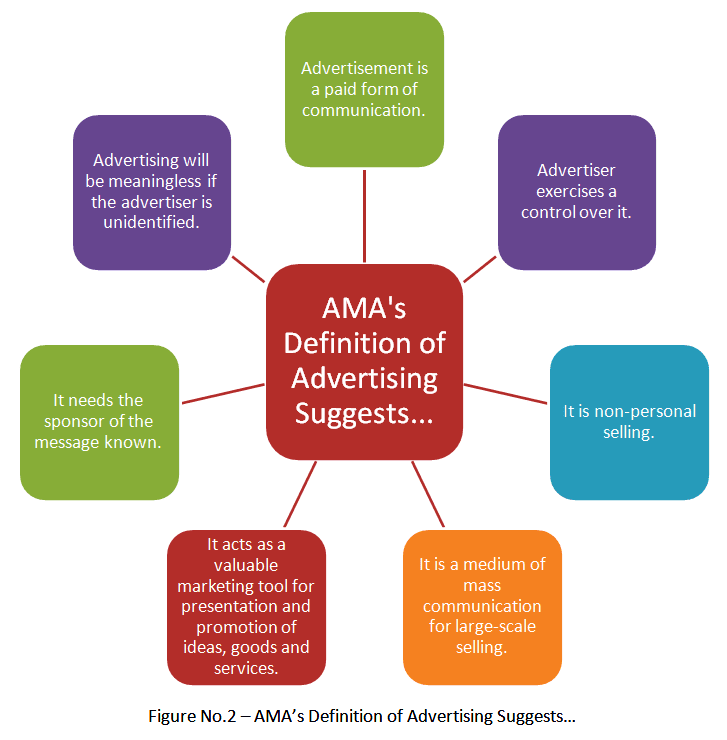 The element of a marketing mix: Advertising is an important part of a marketing mix. It supports the sales promotion efforts of the manufacturer. It makes a positive contribution to sales promotion provided other elements in the marketing mix are reasonably favorable. It is alone inadequate for promoting sales. Many companies now spend huge funds on advertisements and public relations. Let's find out how each group gets benefited by it. 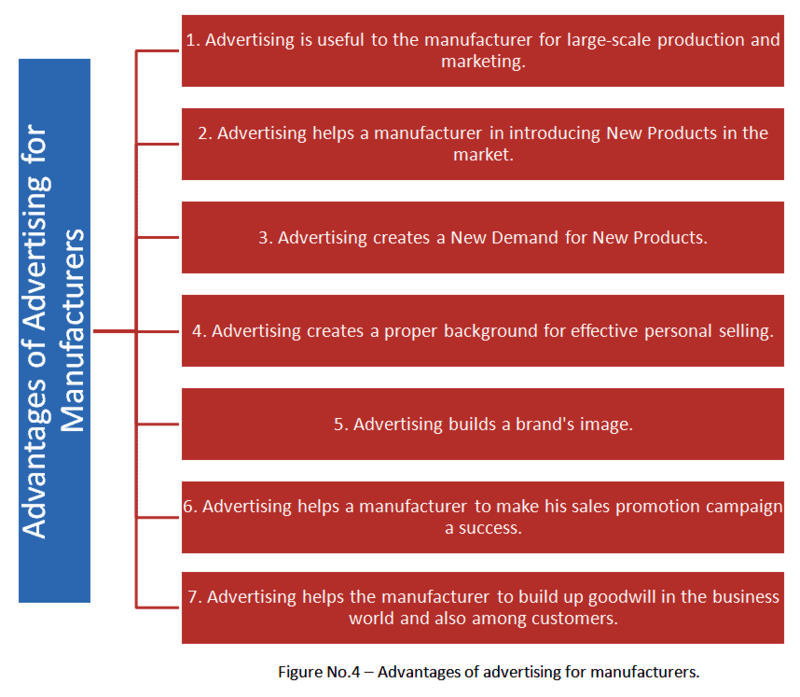 Large-scale production and marketing: Advertising is useful as a sales promotion technique. It gives information to consumers and encourages them to purchase more. Manufacturers expand their production base due to a higher market demand created through advertisements. Introducing new products: Advertising facilitates the introduction of new products. Due to it, information about new products is given to the people (prospects). A demand generates because of this, and the manufacturer can sell new products along with the existing ones. Creates new demand: Advertising spreads information and encourages consumers to purchase new products. It creates a new demand. Customers are offered various concessions in the initial period. It generates positive responses from them, and soon new customers also respond. Thus, advertisement creates new demand from non-users. Effective personal selling: Advertising creates a proper background for personal selling. It gives advance information to the prospects. They visit the shop in order to purchase a particular product that they know through advertisements in media. The job of a salesman becomes easy as consumers develop an affinity for advertised products. In brief, it supports and supplements personal selling. Builds brand image: Advertising build brand image and this develops consumer loyalty towards a specific brand. Manufacturers introduce branding to popularize their products with a distinct personality. Brands get popular through advertisements. As a result, buyers develop loyalty towards a specific brand. Reduces cost of production: Advertising creates demand and promotes sales. It enables a manufacturer to conduct production on a large scale. It leads to a reduction in the cost of production and distribution. As a result, the profit margin of the manufacturer increases. Facing competition: Advertising aids a manufacturer to deal with market competition effectively. It helps him to promote and popularize his products. He can remove misunderstanding among consumers about his products through appropriate advertisements. Sales promotion: A manufacturer can make his sales promotion campaign successful by using the support of advertising. He can prepare a proper background for the success of such an ad-campaign as it facilitates direct communication with consumers. Goodwill builder: A manufacturer can build up goodwill in the business world and also among the group of customers through advertising. The social welfare programs and community service activities can get wide publicity through advertisements. The public can notice even the progress of the organization through it. 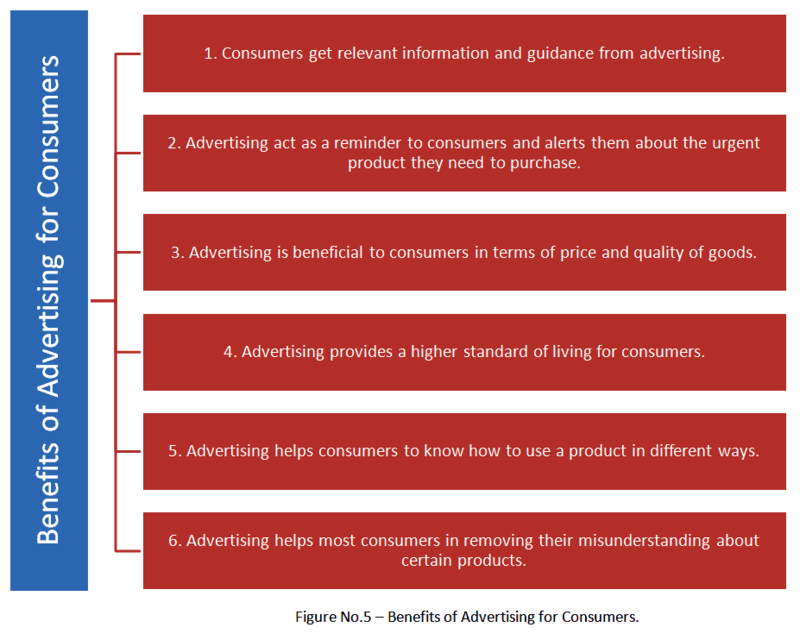 Information and guide: Consumers get information and guidance from advertising. They can study the advertisements of competitors and select the appropriate products that are best suited and profitable to them. It helps to avoid their cheating and exploitation at the hands of middlemen. Acts as a reminder: Advertising act as a reminder to consumers and alerts them about the urgent product they need to purchase. 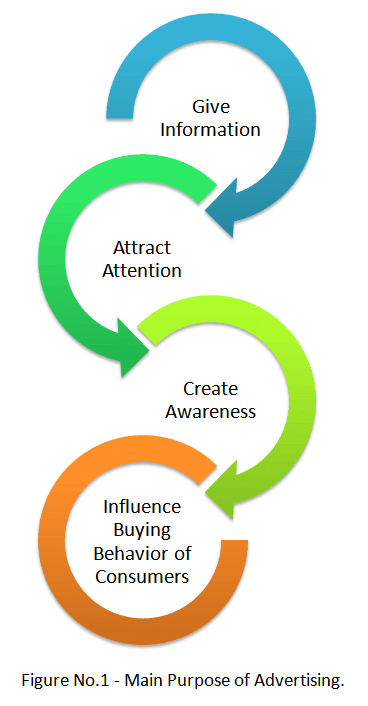 Attracts customers: Advertising leads to competition among manufacturers and retailers. They have to offer something special in order to attract buyers. Such attraction offers benefits to consumers. For example, manufacturers have to bring down the price in order to attract customers. They have to supply quality goods in order to attract them more. All this is beneficial to consumers in terms of price and quality of goods. Raises living standards: Advertising raises the standard of living of people by supplying information about goods and services, which can offer convenience and pleasure to them. It guides consumers in the selection of most suitable products for their daily life. Thus, it provides a higher standard of living to consumers as a social group. Efficient product use: Consumers get information about uses or benefits of different products through advertising. They also get guidance as regards the right manner of using the product and helps to avoid any possible damage from the use of a purchased product. The information supplied through advertisements helps to know how to use a product in different ways. Removes misunderstanding: Advertising helps most consumers in removing their misunderstanding about certain products. They change their attitudes towards products and services due to it. Advertising is useful for giving information and guidance to prospective buyers of consumer durable. Here, it gives the details of special features, benefits, price discount, and other concessions offered, etc. to the purchasers of consumer durable. It encourages interested customers to take the initiative in purchasing the durable articles. Effective advertising of consumer durable creates a proper background for personal selling. It creates an attraction in the minds of consumers, and they are encouraged to visit a retail shop in order to see the article or look at the demonstration of its working. Here, the salesman can use his skills to sell an article to his visitors. Advertising of consumer products enables a manufacturer to face the market competition. He can mention special features of his product and also suggest how his product is superior to that of his competitors. It is useful for sales promotion of consumer durable. Even consumers can make an appropriate selection of a suitable product by studying the advertisements of competitors. 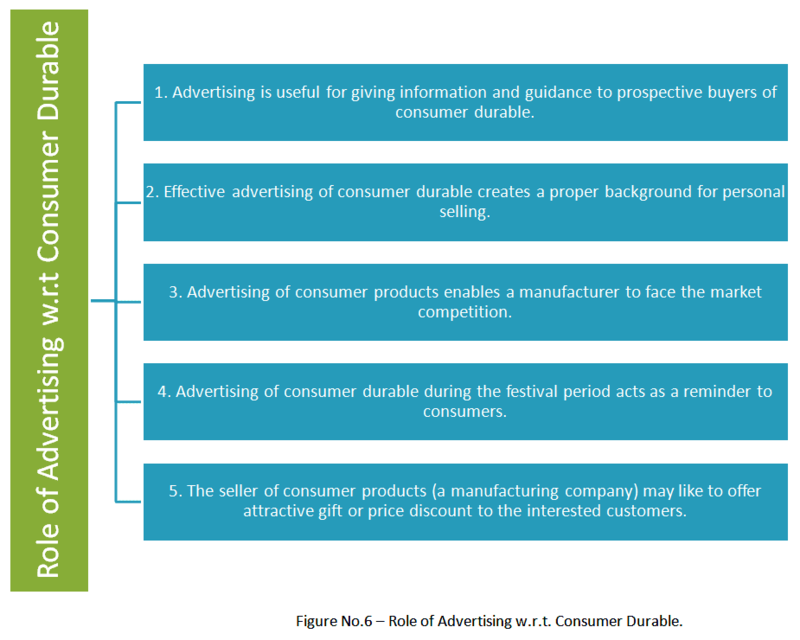 Advertising of consumer durable during the festival period acts as a reminder to consumers. They remember to purchase a useful product on the Eve of the Festival. This technique facilitates a sales promotion during the festival period. The seller of consumer products (a manufacturing company) may like to offer attractive gift or price discount to the interested customers. Here, advertising can be made effectively. It encourages them to purchase a durable product. Such advertisements are common during festivals. Even local dealer may offer certain concessions to potential buyers. He can make a suitable AD of such concessions for large-scale selling at the local level. Print: Magazines, Newspapers, Journals, Periodicals, etc. Broadcast: Satellite TV Channels and Radios. Non-broadcast: Cinema, CCTV, local cable TV, etc. Outdoor: Hoardings or Billboards, Posters, Neon light sign board, etc. Transit or vehicular: Railways, Public transport buses and Tramps, etc. The point of purchase: Hangings on stores, Banners, Pamphlets, Stickers, Window Display, Painted signs, etc. Specialty media: Calenders, T-shirts, badges, caps, keychains, Diaries, etc. Virtual media: Online Blogs, forums, social media websites, email ads, etc. Miscellaneous: Direct mail advertising, Trolleys at the airport, Carts in departmental stores, etc. These advertising media have their unique features, merits, limitations and suitability. An advertiser has to consider his ad budget and then select the most appropriate media to run his ad campaigns. While undertaking advertising for consumer goods, durable or industrial products concerned company has to take appropriate decisions and adjust the ad campaigns activities accordingly. Evaluation and broad decisions need to be taken in regard to these five areas while organizing an advertising program or campaign. Mission refers to the purpose or objective of advertising. The introduction of a new product in the market. The decision in regard to mission or objective is a basic one, and all other decisions get adjusted according to it. For consumer products like chocolate, toothpaste, soap, etc., the mission or objective includes facing market competition, sales promotion and to make a product successful in the market. Money refers to the finance provided for advertising purpose. It makes an AD budget. It means the budget allocation made by the company for running the entire operation of AD Campaign. Money provided is a limiting factor because the effectiveness of advertising, media used, coverage of advertising, etc. are all related to the funds provided for running advertisements. Advertising is a costly affair, and companies have to spend millions of dollars on it. It should always be within the limits of funds provided. Naturally, decisions in selecting an advertising package should be properly adjusted to the allocated AD budget. Consumer products like toothpastes or chocolates are highly competitive with many substitutes readily available in the market. Naturally, extensive advertising on TV, newspapers, radio, etc. is required. These media are costly. So, the manufacturing or marketing company will have to provide huge money for advertising purpose. The message gets delivered through the text of an advertisement. It is passed through written words, pictures, slogans, and signs. It is for the information, guidance and motivation of prospective buyers. Attractive and meaningful messages give positive results, and the advertising becomes result-oriented. For this, the services of creative writers, artists, etc., are used to give an appealing message to the consumers. Which media to use for communicating the message? What would be the extent of creativity? Which specific customer group be targeted with the message, so on. The AD message is related to the decisions taken in regards to the mission, and money provided for the purpose of advertising. For advertising consumer product like chocolate, the message is important for its success. Chocolate is favored mainly by children and teenagers. The message should be such that it is beneficial and appealing to the younger minds. It must have a promise of a taste pleasure and satisfaction as expected by the younger generation. The AD message should be simple and easily understandable with the help of a picture or slogan. It should also be attractive and agreeable to the younger generation. The pictures or slogans used should be short and impressive. The advertiser has to take a crucial decision about selecting a proper media for an advertising purpose. Media differ as regards to cost, coverage, effectiveness or impact, etc. The selection of media depends on the budget provided, products getting advertised, and features of prospective buyers, so on. A wrong decision on media may make entire advertising ineffective and money spent on it will be wasted. Therefore, a media should be properly selected, and decision in this regard is essential and critical. For advertising popular and extensively used consumer items like chocolate, the media should be selected properly. Cartoon TV channels, comic books, newspapers supplement meant for kids, etc., should be preferred. Measure relates to the effectiveness of advertising. An advertiser will like to evaluate advertisement in order to judge its effectiveness. If an advertisement is not effective, it will be modified or withdrawn. It is necessary for avoiding expenditure on the advertisement that is not purposeful or is not likely to give any positive results. An advertiser has to measure the effectiveness of his ad program or campaign and take suitable decisions. This decision-making as regards effectiveness of advertisements is equally important and essential. Such testing facilitates an introduction of appropriate remedial measures if required. For measuring effectiveness of chocolate advertising, the post advertising sale is one major consideration. Demand creation in new market segments or new age groups is another factor in the measurement of an ad effectiveness. Even the success of a sales promotion program is useful for measuring the effectiveness of an advertisement. In brief, like other areas of marketing management, decision-making is necessary for advertising. 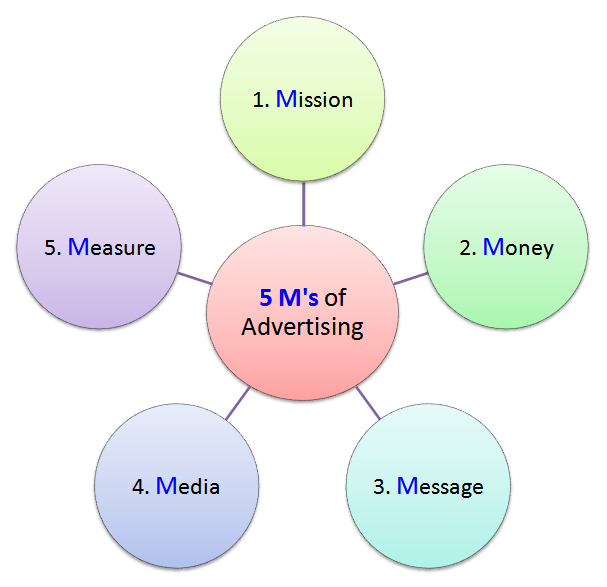 It relates to Five M's - Mission, Money, Message, Media and Measurement. Client agency relationship in advertising. Organizational structure of advertising agency. Great article. Thank you so much! Helped me a lot for my project reference.